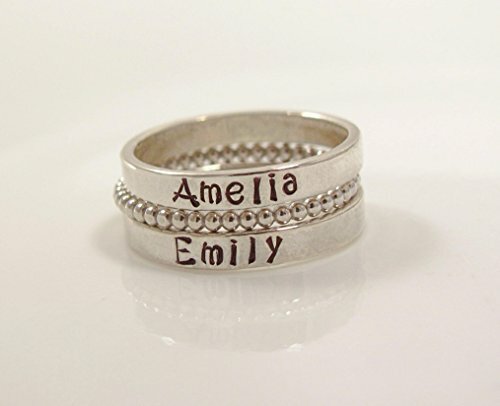 Personalize a Sterling Silver ring with your favorite names, words,quotes or dates. Rings are available in size 5, 6, 7, 8, 9, 10. This listing includes: (2) 2mm Sterling Silver Hand Stamped Ring (1) 1.5mm Sterling Silver stacking beaded rings Ring will be stamped with our "KRISTIN" font which is pictured in the listing. If you have any questions about this product by 925Radiance, contact us by completing and submitting the form below. If you are looking for a specif part number, please include it with your message.